21. Megata, Morikimi. No title. 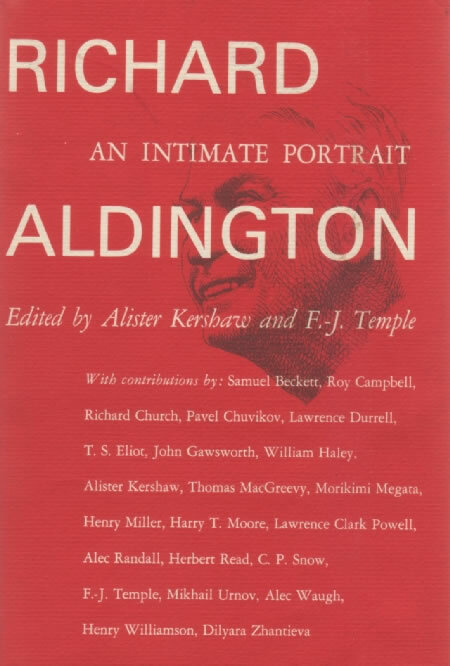 In Richard Aldington: An Intimate Portrait, edited by Alister Kershaw and Frederic-Jacques Temple. Carbondale: Southern Illinois UP, 1965. Megata comments on his ten-year correspondence with his ‘Master’ (see 15) and the friendship that grew from it. Aldington did not mention haiku in the letters, Megata notes, but his knowledge of the form was nonetheless ‘indisputable’, and its influence may be ‘sensed’ in his early poetry. Ultimately, however, Megata does ‘not believe . . . Japanese art and literature influenced [Aldington] much’. His ‘interest in Japan was . . . keen’ and ‘his knowledge of pre-war Japan accurate’, but ‘he did not show an understanding of or sympathy with the changes’ that took place after the war, and his ‘yearning’ for the country was mainly for ‘the dream-land of mystery and beauty depicted by Hokusai [Ap] and Hearn [D9]’. Includes quoted passages from several of the letters.